When it comes to stretch film applications, the first thing our team does is perform an audit of the current environment. We test stretch films at varied prestretch levels, measuring puncture resistance, tear propagation, load compression and containment characteristics. Our film specialists analyze data gathered during testing to make recommendations for a better performing film or to help troubleshoot an existing problem. Once we’ve determined the best films to use in your application, we follow up with training, monitoring, and technical service. John Cook is a polymer chemist who has been innovating polyethylene resins and films since 1973. John’s work at Atlantic brings material knowledge and insight that benefits our customers. Take a look at how Atlantic has been able to help our customers solve problems, improve efficiency, and save money. We’re dedicated to studying and testing the properties of all types of film used in packaging applications. One section of the lab is devoted only to stretch film while the remainder is devoted to the testing of polyethylene film, bags, and sheeting, including shrink wrap. Overall, the Film Lab represents a tremendous source of value and potential for our customers. The lab is equipped to determine film properties and collect data on film performance at various sets of film stretching parameters for various stretch film grades. Our goal is to find the right product or wrap pattern to match a customer’s application. Our data collection at varied prestretch levels of properties – such as puncture resistance, load compression, tear propagation, and load containment – allow us to make film recommendations to our customers with the confidence that these will result in optimal performance, improved efficiency, and cost savings. At Atlantic, we are committed to your success. The work we do in our Packaging Film Lab delivers measurable results for long-term positive outcomes. When our sales personnel, engineers, and technicians first meet with a new customer regarding their stretch film usage, they begin by auditing the current operations to evaluate their stretch wrapping operations, including the load properties and variables, the type of film used, the wrap pattern, film application, the equipment settings, and the condition of the equipment. The results of this audit are taken to our Film Lab for evaluation. Based on the data gathered during the audit, alternate films are tested in the lab to find opportunities for a more optimal film for the particular application. Typically, we can present a customer with a proposal for a new film, upgraded or serviced equipment, and new application settings that can save significant amounts of money and put out a better performing wrapped pallet that avoids load failure (see our Case Studies below). The goal of our Film Lab is to gather data, utilize the knowledge and experience of our film technicians, analyze the results, and make recommendations that match the best film to a particular application. On our Semi-Automatic Power Prestretch Machine utilizing dual electric drives, we can run stretch levels from 0 to 600% with digital settings. Stretch levels can be adjusted at various points on the load during the wrap cycle if desired. Turntable speed can be varied from 0 to 42 rpm with the capability of adjusting that speed while the machine is in motion. This allows some degree of simulation of high speed automatic machine conditions. F2 allows us to fully measure the capabilities of a candidate stretch wrap by determining how it responds to a range of low to high post stretch conditions at a variety of prestretch levels and turntable speeds. Film tension is developed by slowing the film output of the stretch carriage relative to the speed of the turntable. Load compression is the force the film applies to the load as a result of the wrapping process and is chiefly responsible for what we term load unitization. If you have insufficient load compression, the load will be loose and not properly unitized. If you have too much load compression, some loads can be damaged by the crushing aspect of the compressive force. We measure this using 3 load cells arranged vertically on 1 corner of our test box. We have a puncture probe that can extend from 0 to 5.5 inches. This enables us to simulate characteristics of different types of loads we encounter. The puncture test captures the ability of wrapped film to resist puncture from sharp corners when a load attempts to shift during transit, much like the containment test captures the ability of the film to resist further stretching during the transportation cycle. We added a plate to our test box that is used to observe puncture propagated tear characteristics. This plate is 16″ square, 3/8″ thick, and extends out from 1 corner of the box 1.5″. As film tension is increased during the testing cycles, the corner plate will eventually puncture the film (this will vary with film type, prestretch level, and turntable speed). High performance films will accept this puncture but the initial hole initiated in the film will not grow or propagate. As the film tension increases during subsequent test cycles, the hole will increase in size, eventually leading to our proscribed failure level (approximately 4″ tear) or actual breaking of the film web. This is the test we use to determine the maximum film tension any individual film can withstand at a given prestretch level and turntable speed. In turn, this allows us to predict the maximum load containment available from a given film. Load containment is the ability of the film to prevent palletized loads from shifting by offering enhanced resistance to being further stretched. It’s measured by a load cell attached to a ram/plate combination which is extended into the film a specified distance. (This simulates and correlates well with the ASTM 4649 pull test for load containment). At a given turntable speed, we will determine what prestretch level and F2 setting will provide the best balance of puncture propagated tear resistance and load containment for a particular film. Our test box has an electrically driven ram that will push that disc out the same distance each time, at the same speed, with the same force each time, so there’s no bias. Our test environment removes inconsistencies so we’re able to capture an accurate measurement for comparing films. Both load compression and load containment are very highly influenced by the film tension (F2) setting. Higher F2 settings results in higher compression and also greater containment force. Offsetting this relationship results in a loss in propagated tear resistance for some film formulations. By this we mean that some films, when punctured during the wrapping process, have significantly reduced resistance to tearing across the film web as film tension is increased. Basically some films are more prone to film web breaks after puncture than high performance films, limiting the amount of load containment which can be developed in the wrapping process. As we run these tests, we acquire data which can be graphed that will show the compression force the film applies to the load during the wrapping process, puncture resistance of the final wraps, and resistance to further stretching of the wrapped film (containment force) versus time. We can also measure the force required to stretch the film. We can get a real time graph of this data and we can see how it changes at different points in cycles. This gives us the capability to simulate what occurs on some of the high-speed automatic stretch wrap equipment and to gather accurate data on pre stretch levels. In the non- stretch film portion of our lab, we have the ability to run additional tests to measure the tensile properties of film (the amount of force a film can absorb before yielding, and/or breaking, and how far it will elongate prior to breaking), tear properties of film (both machine direction and cross direction), and the toughness of the film with either the Spencer Impact or falling dart impact test, both high-speed puncture tests. We can also very accurately determine the thickness of film and shrink properties of packaging films (machine and cross direction). We can measure the stiffness of films and also determine the strength of heat seals. The test results from our Film Lab pinpoint stretch film properties as applied to specific conditions. Our materials specialist analyzes the test results to match the best films and the best application of those films for optimal performance and cost savings. Our Film Lab takes the guesswork out of setting up an application. Stretch film usage is based on the variability of the application. How stretch film is being used, how equipment is set up and monitored – these conditions vary for each film application. We can use our Film Lab to simulate these conditions and come up with the best film at the optimal settings to achieve high performance and minimal waste. Typically, we find that customers are over applying film. This happens for several reasons. The carriage may be degraded, they may be using non-optimal wrap patterns, or they are applying the same amount of film to different loads of varying weights (see Case Study #1 below). At Atlantic, we specify high quality, high performance films that are engineered with ultimate load holding force and are also very consistent (minimal manufacturing defects). Because of the testing we perform in the Film Lab, we can illustrate these film properties with data. With our specialized stretch film testing equipment, we participate in the development of new stretch films, working not only with film manufacturers but also with the producers of the resins used to fabricate stretch films. Our films are designed to be the thinnest films on the market with ultimate load holding capabilities. This offers our customers a significant savings in terms of cost and also has benefits in terms of secure load containment (less damage or failure), production improvements (reduced roll changeovers) as well as a positive environmental impact (less plastic in the landfills). We recognize that our work in the Film Lab and our work to get our customers set up with the right films and the right equipment is not a “one and done” project. Our team focuses heavily on training all shift operators on the proper settings and operation of the stretch machines. We also install our own patented MUST Stretch Wrap Monitoring System to measure film usage against the benchmarks. If there are variations from the benchmarks, the operator is alerted immediately. Our film material specialist, John Cook, has an extensive background in plastics and film development. During his time with Dow Chemical in the 1970’s, John led a product development team that introduced Dowlex polyethylene for both molding & film applications, including the resin used to produce the first LLDPE based, high performance stretch wrap, Mobilwrap X. His work at Mobil Chemical in the 1980’s contributed to the development of cast LDPE for food packaging and blown and cast LLDPE for flexible and industrial films including stretch wrap. Throughout the 1990’s and 2000’s, John helped develop industry leading stretch films for Linear Films (now AEP) and Pliant Corporation, later acquired by Berry Plastics. A number of leading stretch films were developed under his direction, including ADW and ADU at Linear and R122, R410, folded edge Stratos cast handwrap, and Stratos machine films at Pliant. Today, John heads our Film Lab in Charlotte, NC and is our resident materials specialist. His knowledge and experience are put to work in developing film products as well as selecting films for our customers or replacing existing films for better performance and cost savings. John has worked in the development of trash can liners, coextruded food packaging films, laminations, and PVC flow wrapper films. John’s position with Atlantic brings his expertise together with our sales and technical teams for the best possible outcome for our customer. We don’t let film manufacturers control the conversation. John’s knowledge and insight together with data gathered in our Film Lab are focused on delivering the best possible films to our customers for their specific applications. One customer had loads that weighed anywhere from 200 lbs to 2500 lbs. We saw that they were applying film to every single load as if it weighed 2500 lbs. So the loads that weighed a lot less were being wrapped as if they weighed the maximum. This resulted in an over application of film. In addition, we found that carriages were badly degraded inside the equipment. This condition often leads to an overuse of film as well. Our team was looking for ways to reduce the raw costs of this customer’s stretch wrapping. We found that we could add value by developing a system that would weigh loads and call a specific wrap pattern inside the wrapper. We could also address the issues inside the carriage. The solutions we offered, backed up by the data gathered in the Film Lab, cut their costs by over 40%. Ultimately, that customer ended up saving greater than $90,000 per year. 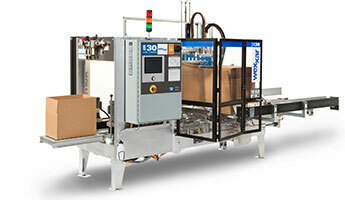 We approached a customer who was running 10 automatic stretch wrapping lines. Out of those 10 lines, we found that machines were performing at about 10% of their capability. In engineering terms, those machines were pre stretching at roughly 10%. From our experience, we knew that this particular application needed to be pre stretching at 250% or more. We ran our tests in the Film Lab, showed our customer evidence to back up our recommendations, and recognized a savings for that particular plant of over $600,000. We are now partnering with that facility to get their equipment up to optimal performance and to provide our technical services.